There is no end to the variety of activities available to Northwest Michigan area visitors and residents alike. In addition to the beaches and lighthouses, antiques, art galleries, casinos and wineries and breweries, be sure to visit some of the following attractions. Fishtown in downtown Leland preserves the heritage of the Northern Michigan commercial fishing industry. The Leland riverwalk area features weathered fishing shanties, smokehouses, fishing nets drying on racks and fish tugs. Several of the former shanties are home to gift and clothing boutiques, art galleries and specialty food shops. 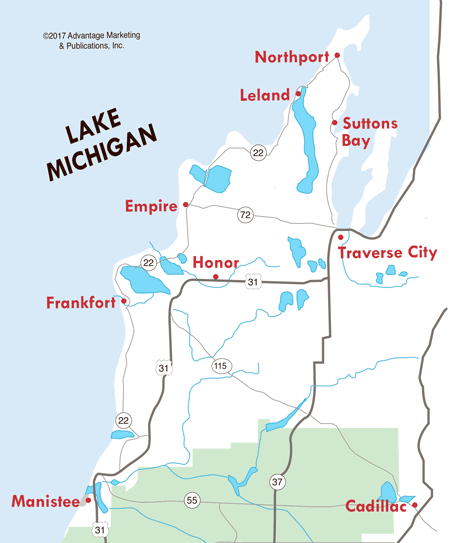 Features exhibits and archives about the settlement and development of the Leelanau Peninsula and nearby islands. Items by local artists are available in the museum store. Restored lifesaving station and displays about the history of the Life Saving Service and daily life at the rescue station. 214 St. Joseph Street, Suttons Bay, MI 49682, (231) 271-3772.